Spiegel & Grau, 9780385527996, 384pp. Ricky Rice is a middling hustler with a lingering junk habit, a bum knee, and a haunted mind. A survivor of a suicide cult, he scrapes by as a porter at a bus depot in Utica, New York, until one day a mysterious letter arrives, summoning him to enlist in a band of paranormal investigators comprised of former addicts and petty criminals, all of whom had at some point in their wasted lives heard what may have been the voice of God. 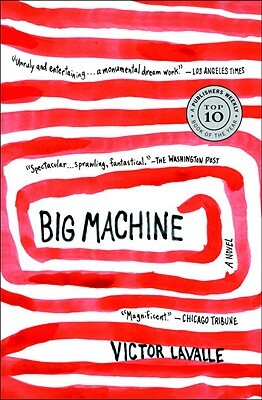 Infused with the wonder of a disquieting dream and laced with Victor LaValle’s fiendish comic sensibility, Big Machine is a mind-rattling mystery about doubt, faith, and the monsters we carry within us. Victor LaValle is the author of the short-story collection Slapboxing with Jesus and the novel The Ecstatic, a finalist for the PEN/Faulkner Award.